Stress can affect you in peculiar ways. “I felt so ill reading that mail I had to admit myself into the clinic at 4 am," Deputy Prime Minister Evangelos Venizelos told The Guardian recently as he recounted the moment he says he realised George Papandreou had not properly thought through the idea of holding a referendum on Greece’s bailout terms in late 2011. Venizelos checked into the hospital again on early on Tuesday, complaining of similar abdominal plains, just hours after the new cabinet was named. One wonders whether it was a closer reading of the ministerial line-up that made the PASOK leader’s stomach turn this time. It is a fact of political life that reshuffles take place to counter something negative such as a bad election result, poor poll ratings, a scandal, a resignation or ministerial fatigue. As such, the new cabinet is always met with scepticism and, often, cynicism. However, rarely has there been a reshuffle that has been met with such a sense of deflation and disbelief as Monday’s. Nobody was expecting Prime Minister Antonis Samaras to pull rabbits out of his hat – after all, the limited quality of Greece’s political personnel and the wear and tear of the crisis left him with restricted options. However, his decision to veer towards the so-called “popular right” and pack the cabinet with politicians whose strongest feature seems to be how loudly they can shout when they appear on talk shows was a surprise. The cabinet is now studded with ministers and deputy ministers (Gerasimos Giakoumatos – Deputy Development, Katerina Papacosta – Deputy Health and Argyris Dinopoulos as Interior Minister to name a few) who have little to show in terms of achievements but possess the strong pairs of lungs needed for a long and persistent verbal battle with SYRIZA. Even the government spokesperson, Sofia Voultepsi, has a history of controversy and confrontation. Then there is the case of Makis Voridis, a former MP with ultranationalist LAOS, who was appointed health minister in place of his former LAOS colleague Adonis Georgiadis. Voridis was also a minister in the 2011/12 interim government led by ex-central banker Lucas Papademos. It was the moment that the far right was fully legitimised in Greek politics, all in the name of sticking to the fiscal adjustment program. Samaras has continued the process of cosying up to this extreme of the Greek political spectrum even if it means raising doubts about his commitment to marginalising Golden Dawn and alienating Jewish groups that find the views Voridis has espoused in the past unacceptable. The vociferous Georgiadis, meanwhile, has not faded into the background. He takes on the role of New Democracy’s parliamentary spokesman. The key ministries (the ones that bear the most responsibility for executing Greece’s program) remained largely untouched by the reshuffle. Kyriakos Mitsotakis kept his place at the Administrative Reform Ministry, as did Yiannis Vroutsis at Labour, which has to work on a second major reform of the Greek pension system over the next few weeks. There was no change at the Justice, Energy or Infrastructure ministries, all of which have big tasks to fulfil. Nikos Dendias moved across from the Public Order to Development, where there was perhaps a feeling that under Costis Hatzidakis things were moving too slowly in terms of liquidity reaching businesses. Apart from that, the only major change was at the Finance Ministry, where economist Gikas Hardouvelis replaced Yannis Stournaras, who is on his way to becoming Bank of Greece governor. But even in this case it was a like-for-like swap as Hardouvelis and Stournaras have similar experience. There have to be questions, though, about how someone like Hardouvelis, a US-educated economist used to moving to technocratic rhythms, gels with the hard rockers from the mosh pit of Greek politics. Samaras has created a core ministerial team with an eye on the future and a peripheral one that is stuck in the past. The only conclusion one can draw is that this combination aims on one hand to keep things on an even keel with the troika and the markets, while on the other creating a tidal wave of rhetoric that will engulf SYRIZA. The decision to choose such partisan personalities in so many spots, while PASOK with just four of 19 ministries retains only observer status, suggests that Samaras is preparing himself for all-out battle with SYRIZA. Perhaps he is keeping in mind that the leftists might be successful in forcing national elections when President Karolos Papoulias’s term ends in February. Many of those who have entered the government are figures that can fight it out with the opposition party on TV and radio shows, while also appealing to New Democracy’s grassroots – especially those who have defected towards Independent Greeks, Golden Dawn and LAOS, which took a combined 15.5 percent of the vote in the May 25 European Parliament elections. Everything points to this being a cabinet with a short shelf-life. It is certainly not the one that will address long-term goals and devise a strategy for the post-memorandum era. 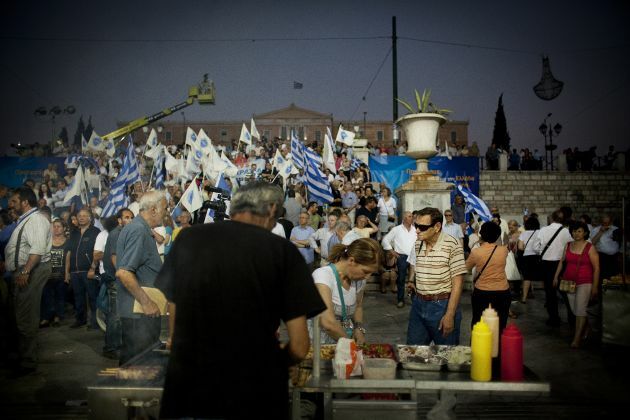 There is little stomach for that kind of thing in Greek politics. "Samaras has continued the process of cosying up to this [ultranationalist] extreme of the Greek political spectrum"